An origami rooster has me crowing! Thank you Vivaan Singh! I reached out to Tanu Shree Singh from the lovely Reading raccoons for some roosterly help. 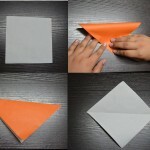 Her ten-year old son Vivaan is an origami whiz and I’ve been following the amazing creations he folds up every now and then. Could he please whizz up an origami rooster? An hour later, a beautiful rooster was crowing away in my mailbox. Here is what I suggest. Give yourself a challenge this week. Sit your little one down, keep this post handy and follow the steps. As they say, take it step-by-step and it will work out just fine. Have the little one press down the creases. When you finish, the two of you will be crowing at your achievement. AND you’ll have a rooster handy to use as a prop when you read out Rooster Raga or dance to the song. Thank you Vivaan for your absolute brilliance and help on this. You are a star! Click on the top left corner to enlarge the first image. Each image has steps mentioned below it. Keep scrolling to your right for the next step. Have fun! Step 1: Start with a square. 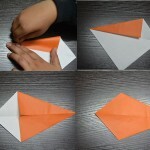 Fold it diagonally to make a crease. 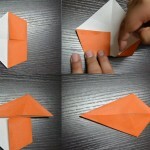 Step 2: Fold the corners inward to align edges along crease. Then flip it. 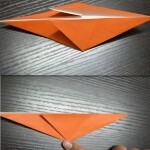 Step 3: Fold paper so that the narrow edge meets the broader one. Step 4: Flip it again. Pull the pocket holding the edge and fold back as shown. 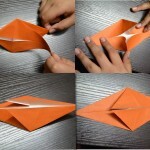 Step 5: Hold the longer edges, pull apart and flatten it. Step 6: See the white line in the centre? 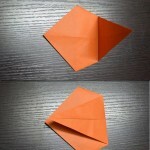 Fold along so that both sides have small triangular flaps on either side. Rooster Raga will be available in bookstores and all online retailers including Flipkart and Amazon by the end of December 2013. To get a copy now, you can order directly on the Tulika books website.